Born on July 13, 1967 . This memorial website was created in the memory of our loved one, Tommy Shafer, 44, born on July 13, 1967 and passed away on June 7, 2012. We will remember him forever. Dearest Tom, I will forever miss your gentle spirit and loving nature. You truly cared about each and every person you came into contact with. I'm so happy we got to reconnect over facebook. I enjoyed hearing about your children, football, bird watching and your passion to help others. You will be forever missed and never forgotten. Tom, we did not really know each other in high school but we got to know each other on facebook on the nights where I could not sleep you were still up. You are a gentle soul and it has been a privilege to get to know you. You will be greatly missed. See you again when I get up there. What an honor to be able to contribute a kind word about a kind beautiful man. Tom, I just loved you so much. I would come home from work every day and tell my husband how much you are loved by all of us and especially how much we respected you. It was a privilege and an honor being your friend. Someday I will see you, again. I am so saddened to hear the news of Tom's passing. I too, worked with Tom at America West. Those were great times in the Marketing department. We were more than co-workers, we were a family. Those memories are deeply treasured. You're a good man, Tom! You will be truly missed! Tom....you always knew how to make me laugh....I miss you so much and will always be remembered in my heart. Tommy, I will never forget the days growing up with you at the Mt, Vista pool and the endless games of H.O.R.S.E. on the basketball court.On one of our many visits together you leaned over and kissed me in front of my Dad.You claimed it was one of the bravest things you ever did! I would have to agree. Be at peace, Brave One! I am going to miss you, Tom. I really enjoyed reconnecting with you, and our middle of the night chats since neither of us could sleep. My heart broke when I got the news, and the tears keep coming. But you will be remembered warmly with love, with a smile and a laugh. I (Sandy Brown) went to school with Tom and had the pleasure to reconnect with him, thanks to Facebook, and although we only communicated in this manner we were able to catch up. Tom was a very special guy with a good sense of humor and such a warm heart. He will be missed! Tom was my first supervisor at AWA. He was so young, only 20 at the time. He was great to work for. He educated, motivated and became our friend. I worked for and with Tom in lots of capacities. His unfailing happy spirit was a joy to be around and made FlightFund the best department at AWA. To Tom and his wonderful family and friends who are here to remember this special man. Words cannot adequately express the feelings of loss and sadness that we share in losing you. 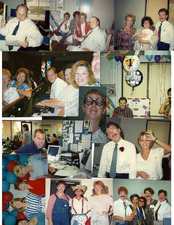 Tom had an amazing ability to make you feel like you had known him all your life. His sharp wit and thoughtful expressions were just a part of his nature. Que Dios te acompane a mi amigo. Tom, you were such a joy to be around at the Seahawk games. You had that famous Shafer wit and always made me laugh. But you also had such a sweet side and that is what I'll remember most. Will miss you bunches, sweetie. I will always remember my fun-loving little cousin hunting Easter eggs in the big front lawn of our Grandma and Grandpa Shafer's farm house; under the graceful watch of that big catalpa tree. Time moves on; memories don't. Goodbye my friend. Tom you were loved and will be missed dearly. You are what made us all a big family in the AWA days. So many great times, so many wonderful memories. I loved being able to connect with you after so many years via FB across the miles. You touched so many of us. I will post a few pictures of those who will always remember you and the memories we shared and now will cherish. Tom, I am saddened beyond all measure! Just when we found you again you are gone. I will miss your laugh, your passion for your Seahawks and our Sunday chats about football! You were such a pleasure to work with at AWA. Kick one through the goal posts in the sky, and wait for the day we see you again! Rest peaceful my good friend! Tom was an amazing and loving person. I loved when we were able to message each other on Facebook so we could keep in touch. He was a great cousin and I will miss him greatly!! Tom, you are loved by so many and have blessed the lives of all of us. I will miss you my friend and will think of you often and you will bring a smile to my face. Thank you for being a part of my life. Rest in peace friend. candle lit by AUNT JODY on June 8 2012. you loved life,family big as well as little times.having you on facebook created a loving bond that is unbreakable.miss you each morning when checking in with your day.LOVE YOU FOREVER. Tom, you, your character, your being; touched so many people in your life; in such a positive caring way. You were such a kind soul. You were and are by far the most thoughtful man I have ever met. You always thought of others often before thinking of yourself. You always had a smile, a joke or a funny idea to share with others. Such a wise caring person you were. I miss you! Please share any memories you have of Tom no matter how big or small. Tom was a very warm hearted spirit with a tremendous sense of humor. I know he touched many everyday.